Cleaning Service UK are rapidly becoming one of the United Kingdoms most trusted experts in the fields of K-Rend cleaning, façade cleaning and all other coating problems. 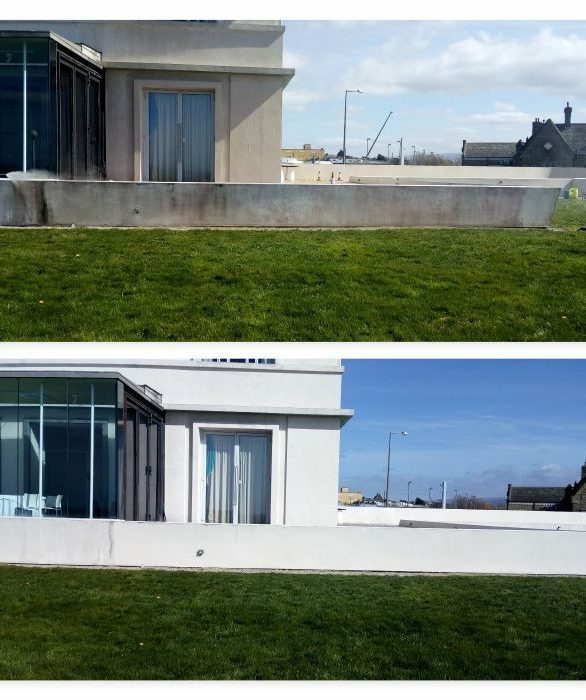 Using our specialised equipment and combining special application methods, we can ensure our K-Rend cleaning services do not damage or discolour your property. Maintaining a commercial or residential property, it is easy to forget about cleaning the exterior of your building. The time and effort which are required for the cleaning of larger buildings, or higher surfaces, is enough of a deterrent for many of us. Cleaning Service UK offer a quick and cost-effective solution to your K-Render cleaning issues. We will carry out work to a professional standard, and you will avoid both the effort of a labour intensive job and the potential risk of injury. To improve our K-Rend cleaning service we have undertook to study the science behind algae growth on K-Rend. This has given us a greater insight and understanding of what is most likely causing your render to discolour . We have developed unique treatments to ensure that your render remains in the best physical condition, free from both organic growths and any discolouration. We also offer high performance protective coatings, which will keep your K-Rend looking cleaner for longer and protect against damage and algae blooms. On top of this, our protective coatings are guaranteed to protect the K-Rend, ensuring your building remains in good condition. Whether you need a full clean of your building’s exterior render, a localised façade ceaning service, or simply an additional layer of protective coating, why not contact Cleaning Service. Our advice is always free, so you may make an informed decision. Predominantly, there are a few ways that cladding/render becomes stained and dirty – organically and atmospherically. Lack of maintenance – For example where gutters and downpipes are in poor condition, leaks can occur leading to the risk of increased damp on the façade. In addition to organic growth, birds roosting on the building may have very serious consequences on the building façade, and acidic droppings can start to eat at the substrate. For example, rendered buildings situated close to roads and located in busy towns and cities are often more prone to developing general dirt and grime build-up on the surface. Although the development over time may not be as noticeable as organic growth, the cladding/render will begin to look faded and take on a dull grey appearance, particularly if a lighter cladding colour. There are two fundamental approaches to the cleaning of buildings or masonry, both of which are offered to a high standard here at Cleaning Service UK. These include the physical approach and the chemical approach. In order to minimise the risk of corrosion or damage, not all treatments are suitable for all building materials. Extreme care must be taken when deciding which cleaning approach to use, which is where we excel over other contractors. We use our experience and knowledge to ensure your building is always cleaned without causing any damage.